A Day as a Tourist in Afghanistan – Traveling Epic! When I started planning my trip across Central Asia, I always had the idea that it would be fascinating to visit one of the most talked about places on the planet. A place where tourists really don’t get. In 12th century Spice Route Afghanistan was an important stop to visit the shrine of Ali, even Genghis Khan felt it was worth a visit or a razing. If you think about it, Afghanistan hasn’t been as safe as it is now, for the past decade, and even before that it may have been since the 50’s that it was a place that outsiders could visit. 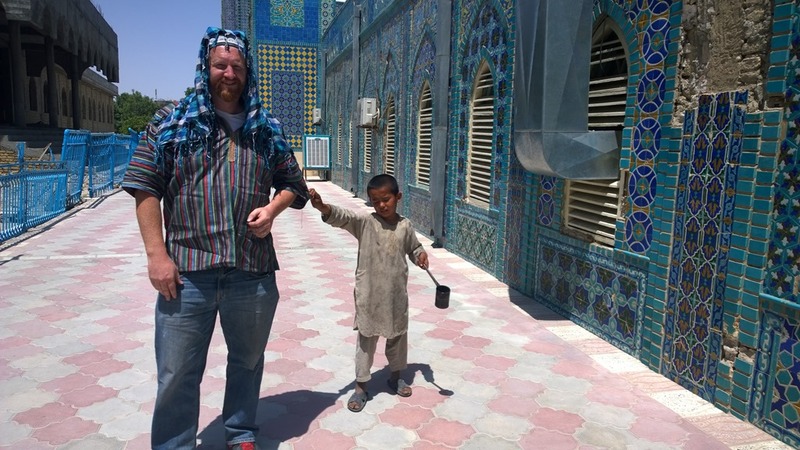 After getting all my visas for the variety of places I was going I got in a good conversation with my traveling partner about the possibility of visiting the city of Mazar-e Sharif. I had a friend on Facebook who I connected with over the past couple of years and have been asking him all about life in Afghanistan. Zaki, my good facebook friend said he’d be willing to show me around his town. It really came together and Zaki fulfilled his promises. Not only that, he ended up spending a couple of extra hours waiting at the border for us to get through. After getting through security and walking across the bridge at Termez going through Uzbekistan and Afghanistan security we finally made it and what an adventure it was. 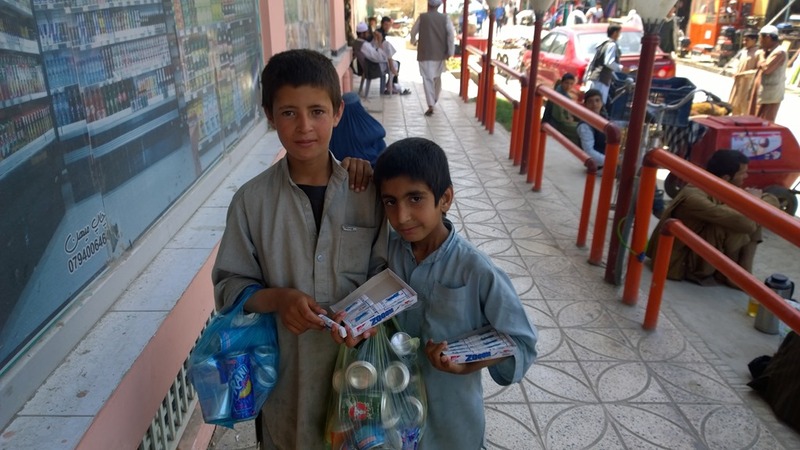 Is there really anything to see in Afghanistan? Oh Yes!! 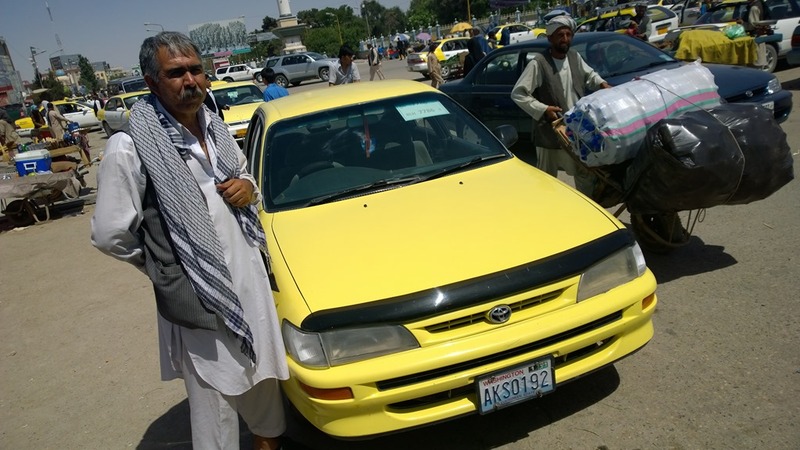 Our driver, the head of security in Mazar-e Sharif, and the uncle of our friend Zaki. 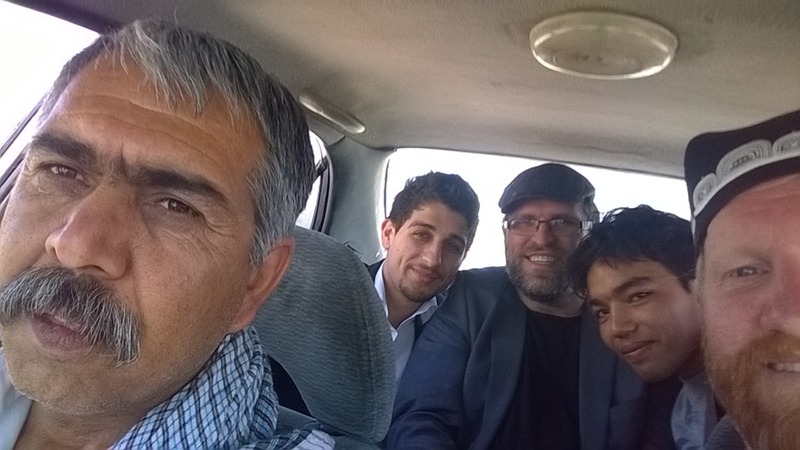 We all piled into Zaki’s uncles taxi and headed out from the border for the city. 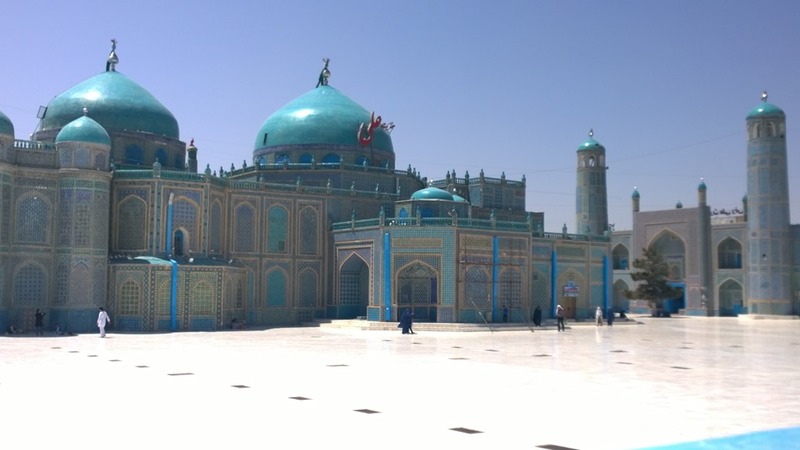 We decided we didn’t have enough time to make it to Balkh, but we were anxious to see the Blue Mosque and Shrine of Ali. 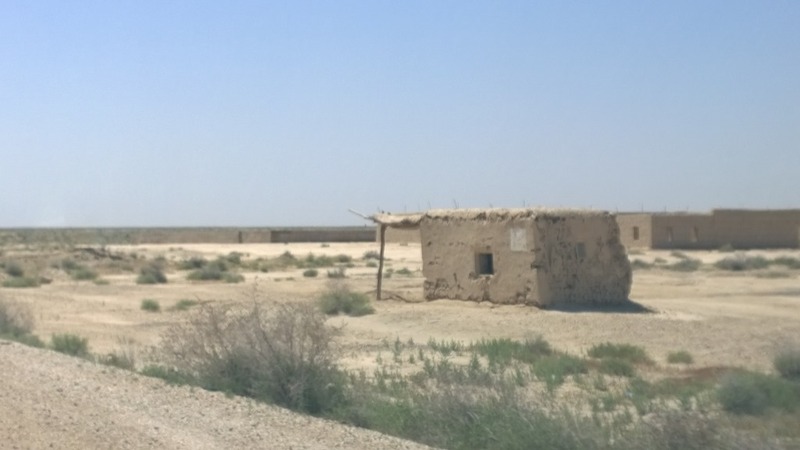 On the drive to Mazar-e Sharif, about an hour from the border, we drove by a number of homes build by mud bricks and natural elements. The sands of the desert working their way to the road. It won’t be long before the sands need to be handled. This little guy was persistent. He didn’t speak a word of English and I don’t know what he was saying, but he was carying a can of hot ashes and mumbling something in a persistent manner. He wouldn’t let go of my clothes. I’m sure he was very poor and hoping for assistance, but not sure what I could do to help. These young boys were a joy to talk to. While language wasn’t our forte, I had some real moments where we exchanged smiles and introduced ourselves. 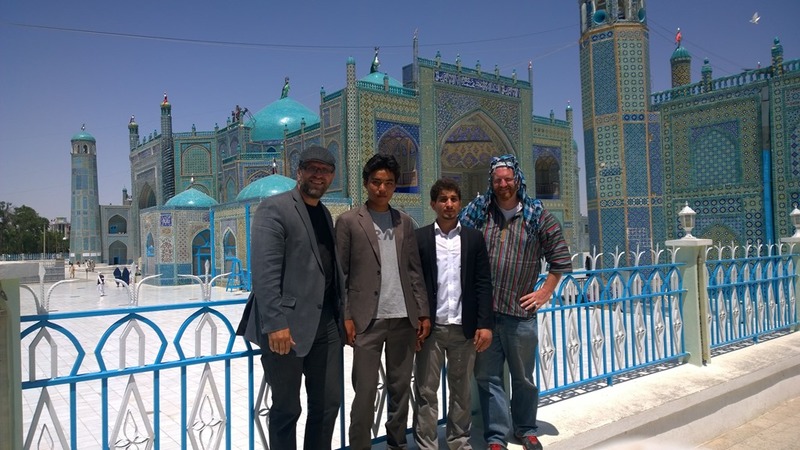 My friend and I with our Afghan Friends Zaki and Hamid in front of the Shrine and Blue Mosque of Mazar-e Sharif, Afghanistan. IT University. 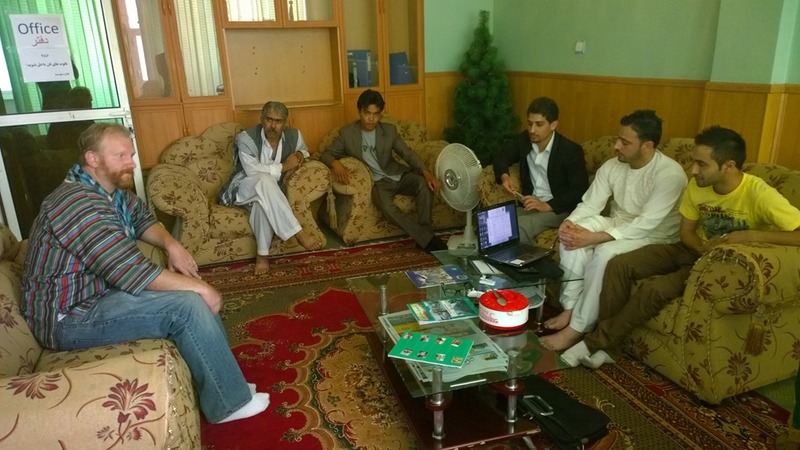 Talking with Ahmad professor at the technical college in Mazar-e Sharif. 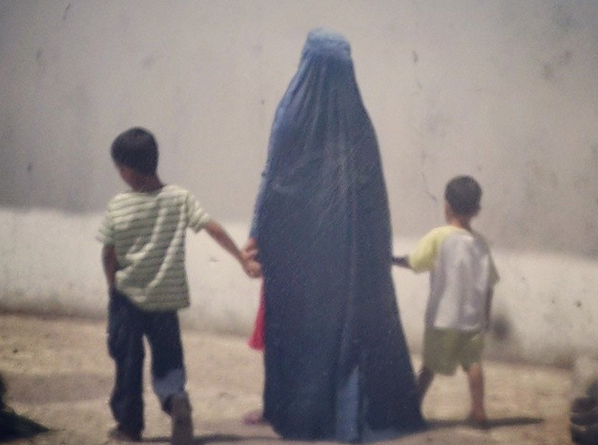 One of the differences between Afghanistan and all of neighbors to the north is the Burka. In terms of cultural differences I found it to be the most start contrast. I’ve been around a lot of Hijabs (head scarves) in a variety of places, and even ran into a lot of Saudis in black full burkas in Kuala Lumpur, and Dubai. I haven’t gotten use to it. It’s really a fascinating thing. The women cover up when they go out. It not only keeps the sun off their faces, but keeps them from being attractive to men outside the home. 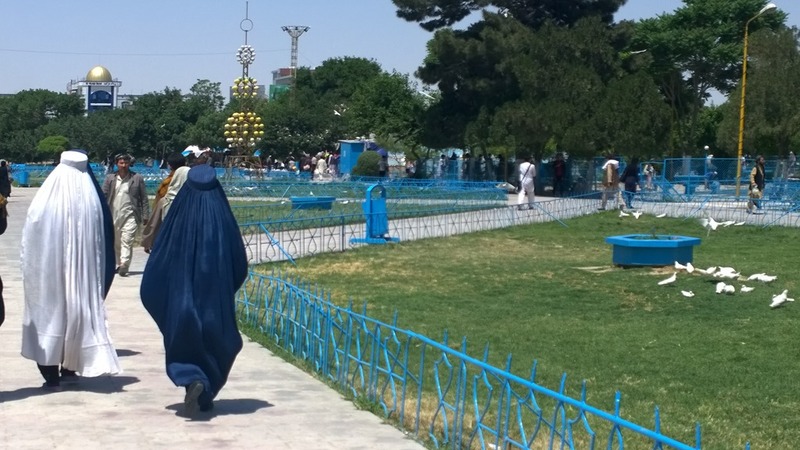 The thing that really surprised me was seeing women that would pull up the burka to interact with their kids at the park. I wasn’t expecting that. Based on what I’d heard and gathered on TV I was really worried they were going to get in trouble. 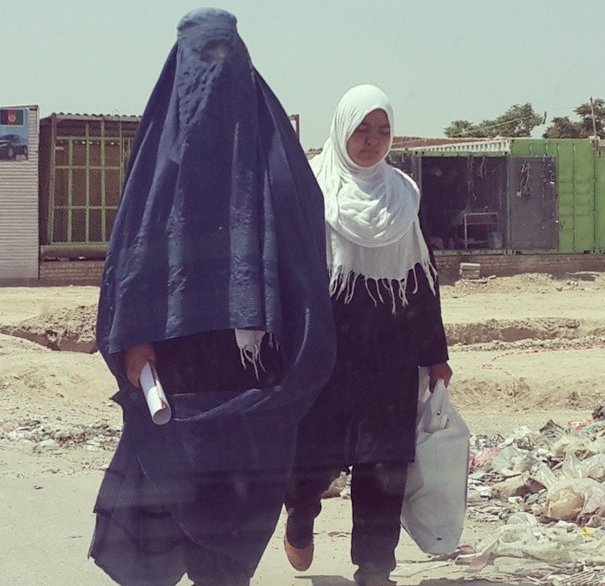 In this far north town in Afghanistan, there were plenty of women in the city that both wore and didn’t wear the burkas. It did seem like most that didn’t wear the full burka would wear the hijab. 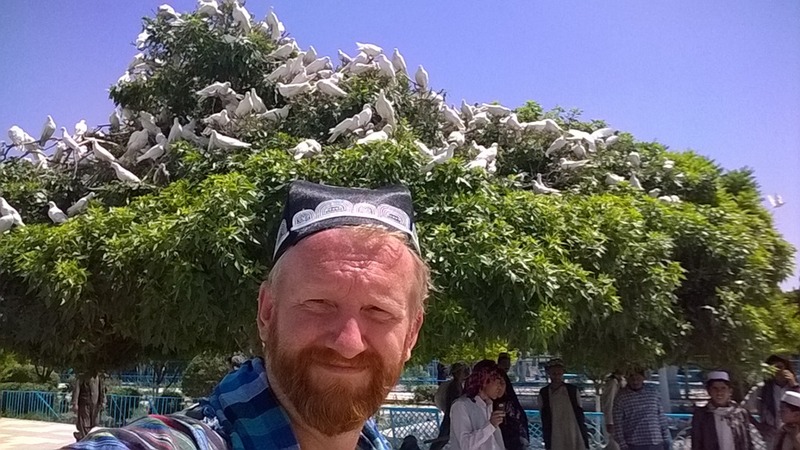 I grew out my beard for months in planning on my visit across Central Asia and “the Stans” coming to Afghanistan hoping to blend in, but ended up not noticing too many beards. I did see some good beards, but for the most part the young men in their twenties would shave, and the older men involved in business seemed to shave into mustaches. I wore an Uzbekistan hat and a shirt I also got in Uzbekistan a couple days earlier. I’m sure it confused the locals, but at the time I wasn’t going for American, even though I’m sure I came across as traveler or tourist which may not necessarily be a be a best practice. The locals were a mix of stand offish, and quite a bit curious. I only had a couple of stares that came across as mean ones. I ended up in a line at the mosque and park to visit the toilet, or what was really just a line of Turkish style toilets or better said, hole in the ground. First time I’ve waited nearly 5 minutes in a toilet line for a squat style toilet. The conditions weren’t great. A few more public toilets would be a good thing when they decide to open up the town as a tourist attraction. 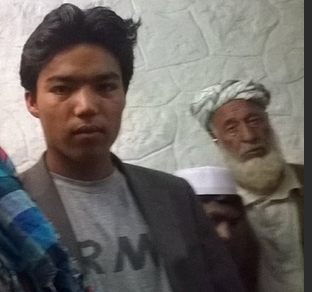 Why did I decide to come to Afghanistan? I have been told that I’m crazy for wanting to visit a country at war. In reality, I found a people very in need of outside love. They are ready for outside investments, education, access to more. I’m sure there are many challenges to getting the right kinds of services in. The youth are very anxious to better understand the world, and connect. I’ve had a number of facebook messages since my visit. There’s so much hope. I pray for my friends Zaki and Hamid, and the Admad at the technical school. Be anxiously engaged in a good cause. Hamid wants to be involved in security, and Zaki wants to be successul in consulting and IT. Personally, I’m very anxious for this area to blossom. This far north the risk wasn’t as great. It really is tightly controlled. We saw the drone balloon, and there were reminders that we were being watched. Even crossing the border we went though a couple of check points, and got some strange looks, but overall, it wasn’t as challenging as I thought it would be getting in and out. Getting the visa for Afghanistan took less than a week, the easiest of the visas on our Central Asia tour. I felt like we timed this right. 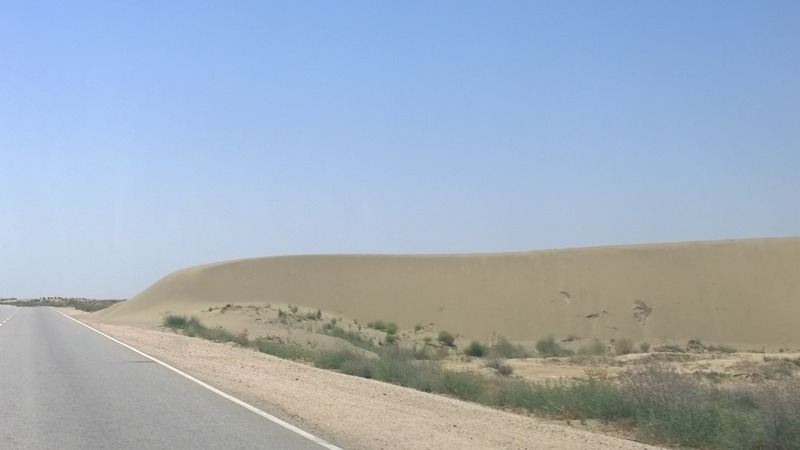 We spent an afternoon, I wish we could have seen Balkh which was another hour and has so much more history, but based on our plan of get in and out while seeing what we could in daylight, we did pretty well. I have no regrets really. I have been blessed in my life to live where I do and I hope the time I spent in this part of the world has helped me and my perspectives and outlooks on life, and I hope that the time I spent with my new Afghani friends helps spread peace and inspires them in their righteous pursuits. 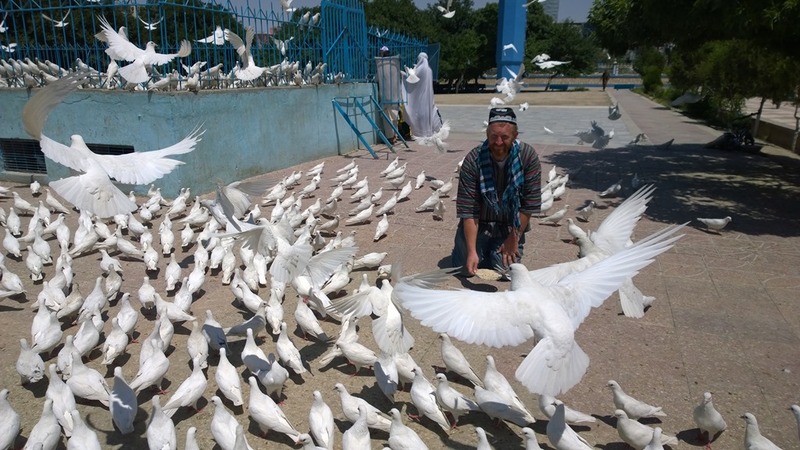 These pigeons look like doves. They bring peace and happiness to the people. They make people smile and laugh. So do I recommend Afghanistan? I think for those who are real travelers, yes. Mazar-e Sharif has a lot to offer as does Balkh based on my research. At this point, our strategy of in and out, worked quite well. We weren’t there long enough to cause a stir, which I find has been a great strategy for us. Whenever we feel like we might be going to an area involving any kind of risk, we play it safe and not spend too much time in any one area, and we don’t back track. We’re always moving. That’s been a great strategy for us. We try to be unpredictable, so no one could plan anything. I don’t have a death wish, it really was a fairly safe and calculated risk. On my pursuits to see and connect with folks in every country in the world, this was an important one for me. I still have strong feelings for the people I met. It really makes this place very real to me now. I think that’s really important. When there’s a war on the other side of the world in an unknown place that’s being fought in a way that’s unimaginable, it’s easy for ignorant people to say, just bomb the place. I have friends there, and it means something to me. The only way to find peace is to find empathy and understanding. Travel has helped provide a mechanism for that. I’ve never met a military person who would want to go back to Afghanistan to visit, but I would. I have friends there that are great people who are making a difference for life in there town. I admit I am a bit of a travel junkie, and I believe that there are good people everywhere as do many of those that visit every country in the world… a pursuit of mine. Congratulations, that was a very good article! It is very important that those who don’t live or don’t have the chance to be in Afghanistan get a bit of what it is like. And it helps breaking the prejudice against Afghans. No doubt it was an important visit for you, but even more important is what you do by sharing it with us. I am also a travel blogger and I have been to quite unexpected countries around the world and whenever I see something about Afghanistan, I rush to read it since it’s my number one bucket list. I wish the best on your next trips and I must say I will be a frequent visitor of your blog! Truly incredible! You went to a country most people avoid. Shrine of Hazrat Ali looks so beautiful, almost magical. Kudos to you to have visited Afghanistan and made connections with the people. I got my visa from the embassy in the US. Very simple request. If you can believe it, I think it has the record for being the fastest visa I’ve gotten that wasn’t evisa or visa on arrival. Enjoy your trip to the stans! I loved it. Looks like I may be back in Uzbekistan in Sep.